Last week, I wrote about how I was taking on the 30 Day Ab Challenge. To be precise, it has been exactly 12 days, and as you can see from the chart below, today is a day of rest. So, how has it been going? Well, after a solid start, I missed days 5 and 6. Things got a little crazy last week and the 5 to 10 minutes that should have been devoted to abs ended up going elsewhere. To my credit though, instead of resting on day seven, I did day six to prevent myself from being a total lame-o. Since then, the count has been steadily rising and I have done a fairly good job of keeping up. That being said, boy, I am feeling it. As much as it pains me though (literally), there really is something so satisfying about having ultra sore muscles. For some strange reason, it makes me feel stronger. That last day or two have caused me to waffle though. The most debilitating factor has become the fact that completing 60 sit ups and then 60 crunches no longer takes a mere five minutes. I am now going on to ten, and can soon see it taking even 15. When I take a moment to reflect on how little time that actually is, I am ashamed of myself for complaining. I mean, my health is important. But, in the moment, at 6 am, more than five minutes of exercise seems to be the most difficult thing in the world. It doesn’t matter how fast you go. You’re going; that’s what matters. Doing something a little each day is better than doing nothing at all, and I often find that as long as I keep this in mind, I won’t give up. Here’s to 18 more days! When I began boot camp a number of months back, one of the first things I realized was that I no longer had abdominal muscles. For those of you who are like Tyler, you’re probably saying, “Jessica, that’s biologically impossible!” Well, I know, but the abs I do have are pretty puny right now. True story. Cue sad face. Here’s to a stronger core! P.S. 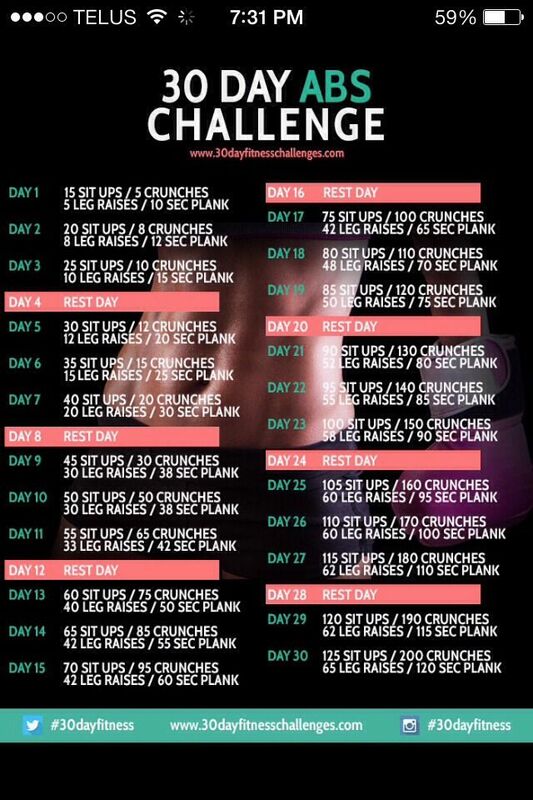 To keep myself on track, I complete each day’s sit-ups right as I roll out of bed. This way, I cannot use the excuse, “I don’t have time,” later in the day.